Teaching kids about our festivals and getting them involved becomes so easy with these interesting art and craft activities for children! With marigold flower garlands, Dandiya raas, and festive sales creeping into Indian shopping malls, the annual countdown to the festival season and holidays has begun. Dussehra and Diwali is an exciting time of the year for most children – family celebrations, school holidays filled with sweets, new dresses and crackers are things many look forward to. What does a child do, however, when all the fun and festivity is unfolding around them? How do you teach kids about our festivals while making it fun for them too? Here are some simple art and craft ideas for children that are fun and relevant to all the festivals in the upcoming season. 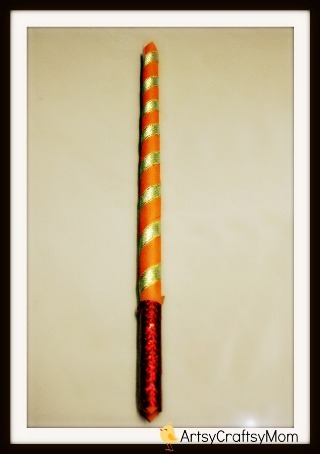 Plain looking dandiya sticks are so passé. Personalize them this season in jazzy colours and glitter tape. Paint the sticks in bright colours of your choice. Alternately, you can even cover them with coloured paper of your choice. Once dry, stick one end of the ribbon at one end of the stick in a slanted direction and begin to wind it around but not too close. Seal it in place. At the bottom, add a different coloured tape to make it jazzier. Every Puja needs a special thali to hold flowers. It’s very easy to get your kids to decorate one themselves. Colour the thermocol plate red. Let it dry. 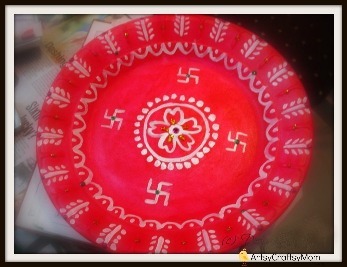 Then using white (or yellow) acrylic colour, paint simple designs on the plate. You can add final touches using glitter glue or sequins or small mirrors. There are many reasons to choose DIY cards over store-bought versions, including cost and personalization. 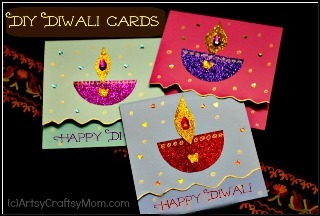 Forget the store-bought Diwali cards and stationary, and make your own DIY Happy Diwali card. I’m sure the grandparents and extended family will be delighted with a card made by their grandchild. Cut out a semi-circle from the glitter paper (a colour other than gold).Cut out a flame like cut-out from gold glitter paper. Stick them in the center of the card as shown in the picture. Draw a zigzag design about 1 inch off the bottom. Cut along the line. Embellish the top of the card with sequins and stickers. Using Gold marker colour along the zigzag edge. Write Happy Diwali in the bottom and your card is ready! Everyone loves to get gifts. Add a little love decorating the gift boxes too. Get the box ready by coating it with paint or sticking coloured paper on it. Stick your child’s artwork in the center. Decorate around it by sticking different coloured pulses. Mix fevicol with a little water and give it a generous coat to seal it in. Fill up the box with goodies and gift it. These 4 festival art and craft ideas for children are all simple and can be made with easily available materials. Try them out with your loved ones this festive season! All other images courtesy Shruti Bhat. 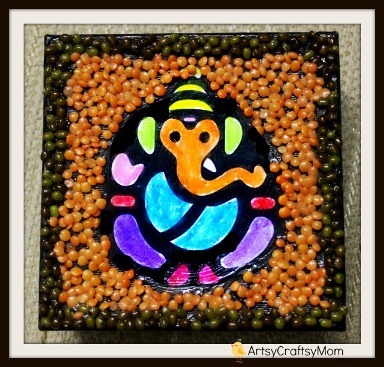 Pingback: 100+ DIWALI IDEAS – CARDS, CRAFTS, DECOR, DIY AND FOOD – ILY INC.